Considering the dearth of posts lately, I don’t fault you if you think I have succumbed to the stresses of school and ceased to bake. I actually have been baking. I don’t know why I have such a persistent obsession with Chinese breads lately. Perhaps I got burnt out on making American desserts? And bread is just so much harder to actually excel at. I’ve been baking the same recipe over and over again: this Chinese sweet bread recipe from Christine’s Recipes. However, I’ve found the bread exceedingly frustrating to perfect. It employs the tang zhong method, which is a starter roux that helps the bread stays soft. However, not owning a kitchen scale, stand mixer, a non-stick pastry mat OR a bench scraper has been very trying. For one, I can’t get my ingredients down to the precise weight, which is crucial in a proportion-sensitive endeavor like baking bread. Also, hand-kneading an extremely sticky dough is near impossible, since the dough just sticks to my hands stubbornly. However, I recently acquired both a kitchen scale and a non-stick mat (I used Matfer Exopat) and I was determined to make this attempt the best. I did some research, and apparently Chinese-style breads benefit from more kneading than you think it needs. Besides, I’d probably get too tired before I end up overkneading the dough and breaking down the gluten chains. I spent at least 30 minutes wrestling with the extremely sticky dough, training my forearm and grip strength and eventually got it to reach an elastic, bouncy texture that none of my breads have reached before. And boy, was it rewarding. This bread has the finest crumb of all the breads I’ve ever made, and it’s also quite shreddable. I did encounter some problems with the finished goods, though. But I’m going to tell you what I did wrong so you can avoid these mistakes. 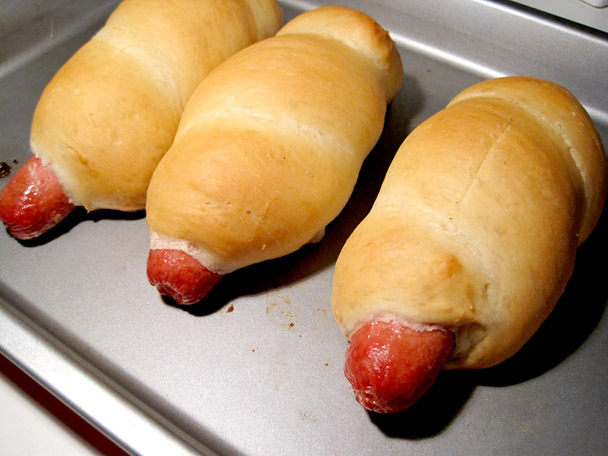 Pat your hot dogs dry before wrapping it in the dough. My hot dogs slid out of the bun after baking. 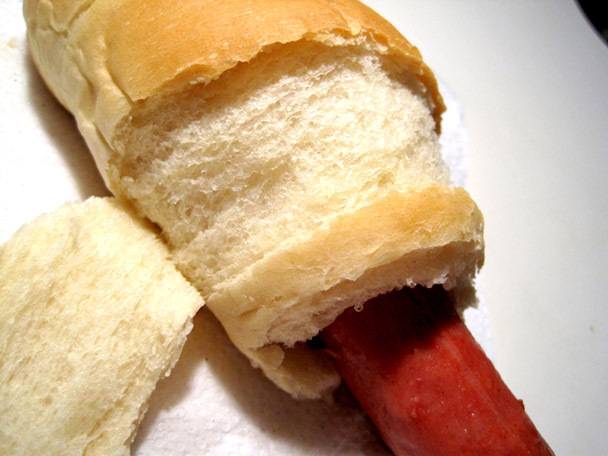 I did like how the hot dog juices had moistened the inside of the bread, imparting a salty dog flavor to it, though. 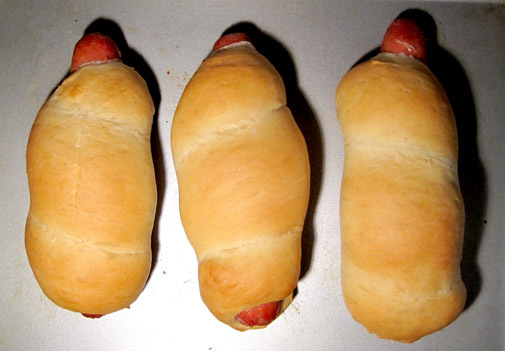 When rolling the bread dough into long tubes to wind around the hot dogs, try to make the tubes thicker in the middle, tapering narrower towards the ends. It will be more aesthetically appealing. Transfer to a clean floured surface. Deflate and divide the dough into four to six equal portions. Knead into ball shapes. Cover with cling wrap, let rest for 15 minutes. Knead each part into a long tube, about 41cm in length (it depends on how long your sausage is). Roll to enclose the sausage, with seals facing down. Place rolls on a tray lined with baking paper, covered with cling wrap or a wet towel. Leave it for the 2nd round of proofing, about 45 to 60 minutes, until double in size. Brush whisked egg on surface of rolls. (I omitted this) Bake in a pre-heated 180C (356F) oven for 35 minutes, or until golden brown. Transfer onto a wire rack and let cool completely.